The best toys for three year olds that will provide hours of educational fun! This post contains affiliate links. Please click here to learn more about our advertising policy. Let’s get your toddler some awesome toys! I’m talking about the kinds of toys that will help a toddler learn while delighting them for hours. I’m defining awesome toys here as the kind of quality toys that are decidedly not junk. Not the kind you’ll curse yourself for buying. Not the kind that will end up in the garbage. The kind you won’t mind looking at. The kind you won’t really mind spending money on because you’re convinced that you’re buying something awesome. (It feels good to buy kids awesome things!) The kind you’d want to play with as a child yourself. A tall tower made from magnetic blocks. Intricate wooden train tracks winding around miniature trees. Miniature pots and pans perfect for “magic soup.” A little nostalgia, a little technology, and lots of fun. I personally own many of these toys. Some I’ve been lucky to see in action at other homes and come recommended by parents whose values I share. There are a few items here that are on my own wish list. My goal is to provide a list of the best educational toys for three-year-olds that will delight them for hours. What are the best learning toys for 3-year-olds when you’re on a budget? Good news: There are tons of great educational toys for toddlers that don’t cost much money. Looking to spend around ten bucks? 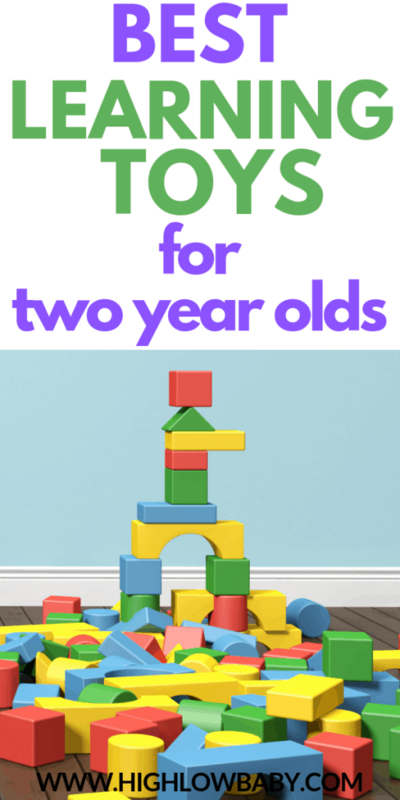 These are great affordable toys for two and three-year-olds. These portable puzzles with charming illustrations are an award-winning toddler toy at a very friendly price. Puzzles encourage problem-solving and skill development as well as spatial reasoning. The pieces are still chunky enough for little hands and the pieces are fairly sturdy. We’ve done a few of these pouch puzzles dozens of times at our house and they still look great– even better than some of the wooden puzzles we own. The plastic pouch makes clean up and storage super simple, which is a real bonus because puzzles can be a pain to store. Learn more about why puzzles are so good for toddler development, read this article from Janice Davis of Learning for Kids. There’s a reason grocery store checkers often have stickers for toddlers: curious two and three-year-olds can’t resist them. Stickers are endlessly versatile and keep toddlers surprisingly engaged while promoting their coordination and spatial awareness. It’s not hard to find all kinds of stickers to match your child’s interests. Whether they love construction vehicles or butterflies, there’s probably an affordable sticker book for that. Maybe the least obtrusive music toy you can give to a 2 or 3-year-old, shaker eggs have a much gentler sound than your average tambourine, but still provide plenty of opportunities for early music making. Making music encourages social and emotional wellness for children, which you can read more about in this great article from Kindermusik. This lightweight set has bright colors and the eggs make a soothing percussive sound. Expert Jean Van’t Hul, author of The Artful Parent, calls markers “the #1 best art material for toddlers”. Scribblers come in a smaller scale than regular Crayola markers, making them easier for younger children to manage. Paired with a coloring book, markers make a classic gift for toddlers. As a bonus, I’ve had great luck washing them off clothing and household surfaces so they’re an art material that keeps the mess to a minimum. According to research out of Michigan State University, matching games encourage cognitive development and help toddlers practice early math skills. This set features adorable woodland illustrations on chunky cardboard that’s durable and easy for toddlers to hold. It’s fun to match the pretty bird, sweet bunnies, and clever foxes drawn by beloved illustrator Lorena Siminovich. As an ideal first game, this set will encourage your child to take turns and follow simple rules. I like that this set can be played with multiple ways. Help your toddler express her feelings with this adorable set from Melissa & Doug. The bear’s outfits and facial expressions are interchangeable, allowing you to discuss a range of emotions such as happy, mad, sad, surprised, and more. What could the bear be thinking? Why would the bear be feeling this way? The simple discussions with your child will help them better recognize and express their own emotions. Play is a great way to tackle this essential learning! My First Brain Quest is perfect for those moments when you’re waiting with your toddler in a doctor’s office or in a long line. These two decks of quiz cards come in a portable pouch. It’s designed to be fast paced, so you can use these cards to kill just a few minutes or enjoy them for longer stretches at a time if you need them. Your toddler will love this convenient tool for building vocabulary. “Can we do Brainquest?” is not an uncommon request at my house. These budget items are just some of the best toys you can get to help your two or three year old learn and grow. What are the best educational toys for 3 year olds? We want to choose toys that will delight and entertain children for hours while helping the build practical life skills, stretch their imaginations, and encourage their development. Remember, we’re looking for awesome toys that are not junk going to end up in the garbage. 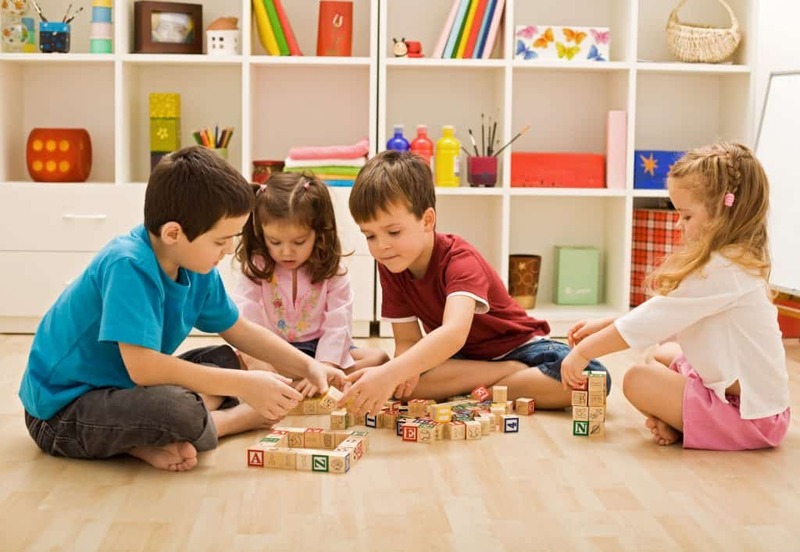 The best educational toys for toddlers promote skill development, gross motor development, fine motor development, socialization, and open-ended play. I’ll take you through several toys in each of these categories. Choose a few (or several!) and you’ll be on your way to creating hours of happy play for your amazing toddler. What are the best open-ended toys for 3 year olds? You want open-ended toys for your children that will encourage them to use their imagination. Magformers are magnetized geometric shapes that can be configured in many different ways. Your child can assemble them flat to make 2D pictures (similar to how I remember using Tangrams growing up) or they can build amazing 3D structures like houses, animals, vehicles, and more. This is a great early STEM toy that encourages spatial reasoning. My child likes to use her Magformer creations with action figures as an extension to the creative play. We have the pastel set, but the colors are the only thing that makes them different from other Magformers sets. Magformers aren’t cheap, so think of them as an investment. They will last well beyond the toddler years! The large scale of Mega Blocks is everything. We use them primarily to build towers and walls, but I also love them for teaching toddlers how to sort by color and size. They fit together easily and clean up nicely in their large plastic carrying bag. They’re a great open ended gift for toddlers because they’re big, colorful, and virtually indestructible. For this reason, we have two sets: one at home, and one for Grandma’s house. Check out this blogger’s post on learning activities with Mega Bloks to learn more about their versatility. This train set is a classic toy for toddler boys and girls. My husband was so excited to buy this for our toddler and he loves expanding her basic set. Our train has taken passengers through many different scenarios, seemingly different every time, even if the track is often the same. If you’re a fan of wooden toys for toddlers, Brio has a great reputation for using high-quality materials that last. Start with a basic set and if your toddler loves it you can add on new tracks, bridges, tunnels, and more. I vividly remember playing with my Little People house as a child and now my girls have their own. I’ve been surprised by the longevity of this toy. Ours gets near-daily use because my child loves to invent scenarios for her Little People family (and other miniatures) to enact. A dollhouse gives children a wonderful space for roleplay. Listen to your child playing with dolls of figurines and you’ll have fascinating insights into what’s preoccupying them at the moment. The latest version of this classic Fisher Price toy comes in multiple colorways so you can choose a blue or pink color scheme. Often seen as the perfect big-ticket birthday gift for toddlers on Christmas and birthdays, a play kitchen can keep a toddler busy for quite a while as they pretend to prepare and serve meals of all kinds. This KidKraft version gets a lot of love because it’s cute but gender-neutral. If you watch for sales, you may be able to get it for under $100. Adding a few playsets to get your child started is a good idea. I like this simple set from Melissa & Doug. If you’re looking for a more compact option, I’ve seen this Hape kitchen work well in small spaces. What are the best toys for 3-year-olds that encourage gross motor development? These toys are for those days when you really want to get your toddler moving (AKA, every day). These toys will help your toddler develop coordination, acquire some sports skills, and improve their strength and balance. We all know toddlers need lots of exercise and these toys will help them burn off some of that excess energy! I’ve tried to provide a balance of indoor and outdoor toys, though a couple of these options could be used inside or outside in the right circumstances. Micro mini scooters are ubiquitous for a reason. Customers report that this toy for toddlers is well-made, durable, and smooth, which is why it’s an award-winning toy for toddlers. Watch your kid take off on it and be amazed as they intuitively figure out how to steer and balance. This scooter is relatively quiet, comes in tons of colors, and gets great reviews. I personally love the micro mini because it provides my toddler with great exercise without taking up a lot of space. This is one of those items that makes a perfect Christmas gift for toddlers. If you do buy this scooter for your toddler, be sure to pick up a helmet too. Nutcase has several cute child-size options. This trampoline is an ideal toy for the winter months when your toddler likely isn’t spending much time outdoors or those intense days of summer heat when it’s better to keep them inside but they need something that will tire them out. Jumping provides hours of entertainment while helping toddlers develop bilateral coordination. This trampoline is very easy to assemble and takes up only a small amount of space, making it a good buy even for families living in smaller spaces. The foam handlebar may take a beating (ours has more than a few bite marks) but otherwise, I have no complaints about the quality of this trampoline. If you have space, the Nugget system is an amazing gross motor toy for the toddler years and beyond. (Confession: This is definitely on my wishlist for my someday playroom.) Jump, play, and build on this four-piece foam “furniture” that can be configured in many different ways, providing endless opportunities for gross motor play. The covers wipe down easily but are also machine washable and come in an array of colors. 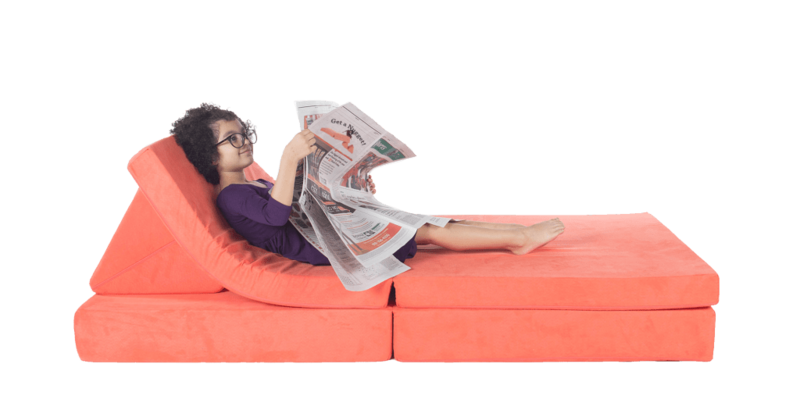 The Nugget is pricey at $229, but since it’s essentially toddler-friendly furniture (no sharp corners! ), many reviewers claim it’s well worth the expense. This basketball hoop was the first toy my toddler used to run for during free play at our local gym. Maybe she overheard her parents watching the NBA playoffs after putting her to bed? The hoop is adjustable so that it can grow with your child. It’s a straightforward piece of equipment designed to help toddlers succeed at making baskets. My toddler loves that we clap and celebrate every time she makes a shot. It’s also one of those toys that you might find yourself playing with too! 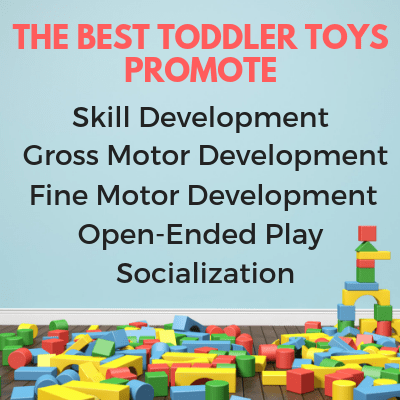 The plasma car is another award-winning toy that makes this list. There are so many ride on toys out there but after reading about several, I chose a plasma car for my daughter. It’s the rare ride on toy that can grow with your toddler and stand up to regular use for many years. The plasma car doesn’t require any batteries and isn’t powered by pedaling. Toddlers may choose to scoot around on it by propelling with their feet, but eventually, they are supposed to ride with their feet up, using the steering wheel to navigate. It may not be flashy, but I think it’s the perfect alternative to Power Wheels. What are the best toys for 3 year olds that encourage fine motor development? Fine motor skills will help your toddler master skills they’ll need in preschool. Think buttoning their coats, washing their hands, and cutting paper. These toys will help them refine their skills so they can focus on more complex tasks. Lacing beads are one of those great portable toy options that also happen to be quiet– another toy that’s ideal for situations that require toddlers to wait. Lacing beads build your toddler’s fine motor skills while also providing opportunities to practice patterning, color recognition, and hand-eye coordination. Go for a big bucket of beads for plenty of practice. Or pick up this sweet set for a nice stocking stuffer. Stackers build fine motor skills while encouraging your child’s creativity and you’ll love this unique rainbow set. Your child can practice stacking the arches in a tower or sorting them by size to build dexterity. She can also use them to review colors and practice counting. There are many possibilities. Plus, it makes a bold and beautiful piece of decor, the kind of toy that looks great just sitting on a shelf. I’ve already mentioned puzzles in this list, but I’ll add another plug for them here. In addition to cognitive benefits and improvement in spatial reasoning, puzzles help build the muscles that will eventually help your child write, draw, and even tie their own shoelaces! Start with these simple puzzles and once your child masters them, move on to more complicated jigsaws. What are the best gifts for a toddler’s social development? You want your child to get along with others, to cooperate, take turns, and empathize. These toys help children practice social and emotional skills as they play. You’ll love watching your child practice how to be a good friend and citizen. Have you heard of Green Toys? They’re a special company because they make their products from recycled milk jugs. So cool. This tea set is the foundation of a very fun first tea party. It’s lightweight, unbreakable, and comes in gender neutral palettes perfect for girls or boys. We have one set in our play kitchen but it often migrates to the bathtub because it’s so fun to practice pouring with the teapot. Help your child practice helping others by giving them these Melissa and Doug cleaning tools. They can help Mom by “spraying” the countertops, pretending to wipe up messes, and sweeping the floor. This set teaches good practical life skills while also giving your toddler a sense of pride because he’s such a big helper! This set is also attractive enough to keep out– I’ve seen it fit in very nicely in some gourmet kitchens. Your toddler will love pretending to be a grown up in a wide array of dress up clothes and costumes. I’m particularly fond of these career options: doctor, firefighter, and construction worker. Dressing up will help them build their vocabulary as they use playing pretend to learn more about the world around them. Role-playing like this builds social skills by helping children to find creative solutions to everyday problems. Pretend play with dolls and stuffed animals can help your child develop their own self care skills. In this great article by Christie at Mama OT, you can read all about the benefits all children (girls and boys) receive from playing with dolls. There are social and emotional benefits, but cognitive and fine motor benefits too! Yes, toddlers are practicing nurturing skills, but they’re also learning a lot about how to take care of themselves. I like the Bitty Baby from American Girl as a first doll. When it comes to stuffed animals, you can’t go wrong with anything by Jellycat. Whew! That’s 24 awesome educational toys for your three year old. You’ve got some budget options, some big ticket items, and lots of great gift ideas in general. More importantly, you now have tons of ideas about how to inspire hours of happy play in your home. I hope you’re excited about all the fun ahead! P.S. If you have a baby, definitely check out this article on newborn toys and this one on the best toys for babies 6-12 months.